Need anything? 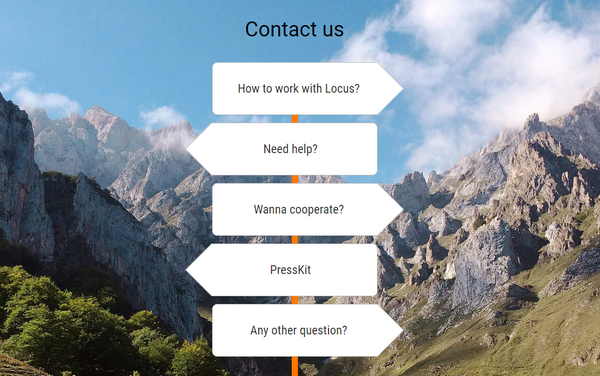 Contact us!Locus	Need anything? Contact us! This way you get to Locus Map User Guide. It contains a complete knowledge base regarding controlling of the app, its functions, features, settings, tips or tricks, frequently asked questions, advanced advisory, customization instructions etc. When you don’t find your answer in the User Guide, come here – it’s a direct link to Locus Map Helpdesk. Our team will do their best to solve your issues, answer questions and tackle problems 24/7. Are you a representative of a business and are you interested in cooperation with us? Please enter here. Do you work for media and are you interested in writing about Locus? Here we offer a set of articles and graphics you are free to use without need to ask us. If you didn’t find your topic of question among the signs above, please feel free to ask here via a simple form. We’ll get back to you ASAP. We’re looking forward to the feedback from you! I want to cancel the subscription until the function is properly processed. How to do it? I did not find the opportunity to cancel in the Locus store. Hi, what subscription would you like to cancel? Any maps or features? what do you mean by “way points based maps”? Is it points of interest displayed on maps? Download Asamm LoMaps from Locus Store. They contain dynamic POIs. If there’s a different problem, please contact us at help.locusmap.eu. I like and use Locus Pro a lot but there is one thing that really bothers me from beginning. Why Locus is not able to offer a consistent view of city and town names ? You can zoom in or out but it is pure coincindence if you see a town name or not. Even big cities don’t show their name. Instead I see a lot of (not really) important names of highway exits. I use openandromaps and with Cruiser app there is no problem to get a correct view of city/town names in all zoom levels, so what is the problem with locus ? And a second really disturbing issue is, if I use the “turn map” mode, all the labels of the map get also turned – why that ? This is a basic feature of all map apps to turn the map but not the labels. I wonder why these really essential features do not even have an entry or votes in the ideas section ? the problem of inconsistent displaying of city names is in OSM database from which our LoMaps are rendered (and Andromaps too). We know that and Locus users too, e.g. http://help.locusmap.eu/topic/city-names-on-vector-maps. Guys in Cruiser obviously found a solution – but not us, so far. We’re working on it. Similar situation is regarding the map label rotation – dedicated car-navigations like Sygic or Tomtom don’t rotate them, that’s right. It’s also because they’re dedicated – they use only one type of map for one purpose. Unlike Locus Map, offering maps of many providers, of many data formats, for many purposes. And car-navigation is not the main, we are a priori an outdoor app. Nevertheless, at least for vector maps, there is a solution that we have to find and implement. And it’s not true that this essential feature doesn’t have an idea entry. See e.g. http://help.locusmap.eu/topic/heading-aware-rendering-for-vector-map-rotation. There’s always a lot of work on our app, we know it. Locus is one of the best app for nav. Just to say that plz add AIR NAVIGATION option in it for pilots like me. Thanks. Locus Map is primarily an outdoor activity navigation app – for hiking, biking, geocaching etc. Aviation is not our field of expertise and Locus Map is not designed for it. could you add a 3D map model view,just like google earth or orux map app? The offline dem data can construct a 3D terrain, which has a intuitive illustration when hiking. Thanks a lot. Hallo! Bei meinen aufgezeichneten Tracks wird der Kartenausschnitt der Route nicht gerendert. Das ist schade, weil ich beim Teilen der Route nur die Statistik sehe und nicht Karte. I’m sorry we communicate in English only. Have you checked your settings of the track line style? Beginning with the app default style (Locus settings > Maps > Points&Tracks > Track line style). For more fluent communication, please contact us at help.locusmap.eu. It would be really helpful if Locus could display tracks in igc format. Furthermore, it would be nice to record tracks in Locus in valid igc format as a back-up to my flight instrument. Today, I use an additional app just for this purpose. we are sorry but we are not going to add support of flight recorder data format – Locus Map is an outdoor navigation for hiking and mountain biking. There are a lot of free web converters that can convert igc to e.g. GPX that can be imported to Locus as back-up (see e.g. http://www.gpsbabel.org). I wonder if the Travel Time can be set by user, for example, the Speed, Vm/h and Rest Time. Hi, no, only choose among offered profiles. They are all tested and created upon consensus with Locus power users and beta testers. Der neue Routenplaner ist ein Graus. Sicher ist es angenehm, wenn ein Programm dem Anwender das Setzen der Wegpunkte abnimmt, aber das muss dann auch technisch einwandfrei sein. Der neue Locus-Routenplaner ist (noch) zu mangelhaft. Er kann immer wieder nicht die Strecke berechnen. Irgendwann geht das wieder teilweise. Und dann werden alle nicht verbundenen Punkte Kreuz und quer mit vorhergehenden verbunden. Die berechnete Strecke ist dann sehr viel länger. Wenn nicht berechnet werden bzw. Der Weg auf der Karte nicht eingezeichnet werden kann, dann wäre es sinnvoll, diese Teilstücke nach Art des alten Streckenplaners einzubinden. Gebt mir den alten Routenplaner für die reine manuelle Wegplanung zurück. Der neue ist so nicht zu gebrauchen! Ja, was ist Locus ohne einwandfreiem Routenplaner? Nichts! could you add 3D map model? like google earth or orux? Neviem či je moc rozumné dávať odkazy k dokumentácii a napovede do kontaktov. Tam to bude hladať malokto. Radšej by som dal odkaz ako pri každom bežnom projekte do hlavného menu – help/documentation pripadne support. A pre zlepšenie prehľadnosti by som spojil menu application a download. Proste sa inšpirovať konkurenciou, nech sú webstránky viac prehľadné. Program robíte výborný, trochu viac ale treba popracovať aj na prezentácii. děkujeme za názor. Máme zkušenost, že z 99% případů nás uživatelé chtějí kontaktovat kvůli supportu – chtějí vědět, co a jak funguje, popř mají nějaký problém. Většinu odpovědí na první dotaz lze nalézt v dokumentaci, kterou jsme zřídili právě z důvodu snížení zátěže support týmu. Problémy řešíme na helpdesku. Takto se nám lidé budou “třídit” hned na vstupu. Proto se stránka nenazývá “Kontakty”, ale “kontaktujte nás”, tzn. oslovte nás, zeptejte se nás apod. Išlo mi hlavne o dokumentáciu, je výborne spracovaná, ale nikde nie je priamy odkaz na hlavnej stránke. Čo je pri každom bežnom softvéry/webe, info a aplikácii a dokumentácia je vždy v hlavnom menu. Riešenie problémov v “Kontaktujte nás” je ok.
Ahojte. Že ste výborní viete, že na mape LM Slovakia (mám LocusPro) chýba žltá TZT Paseky – Voniaca (Tisovec) asi neviete. So želaním veľa úspechov jozo pilko. Dobrý den, nevieme… my bohužel mapy nekreslíme, generují se z OSM dat, které zakreslují mapaři v tomto projektu zapojení. My jim pouze “dáváme kabát”, aby byly přehledné a čitelné a umožňujeme jejich zobrazování v naší aplikaci. Pokud někde najdete v mapě chybu, můžete ji přímo do mapy vyznačit pomocí OSM poznámky (viz http://docs.locusmap.eu/doku.php?id=cz:manual:user_guide:maps_tools:osm_notes) nebo se přímo stát mapařem OpenStreetMaps projektu a trasu zakreslít do mapy přímo. Více info na Openstreetmap.org.